​​When you head off to your favorite music festival, you know to anticipate a few things. Good music, schedule conflicts, the occasional mud-fest, new friends, and lots of drugs and alcohol. Regardless of the legality of such things, drug culture and festival culture inextricably overlap. That’s not exactly news, however. What is interesting, though, is a recent study that attempts to reveal which drugs are most common at which festivals. Conducted by Detox.net, a website offering assistance for those seeking help with substance abuse and addiction, the researchers scraped through over six million unique Instagram posts about a range of music events over the last two years. They then separated the results by festival, and then again by mentions of drugs and alcohol. The resulting data gives a fascinating glimpse at which substances are most popular at which festivals. Not all the results are terribly surprising. For example, 95.4% of posts from Marley Fest mentioned marijuana in some way. Shocking? No. 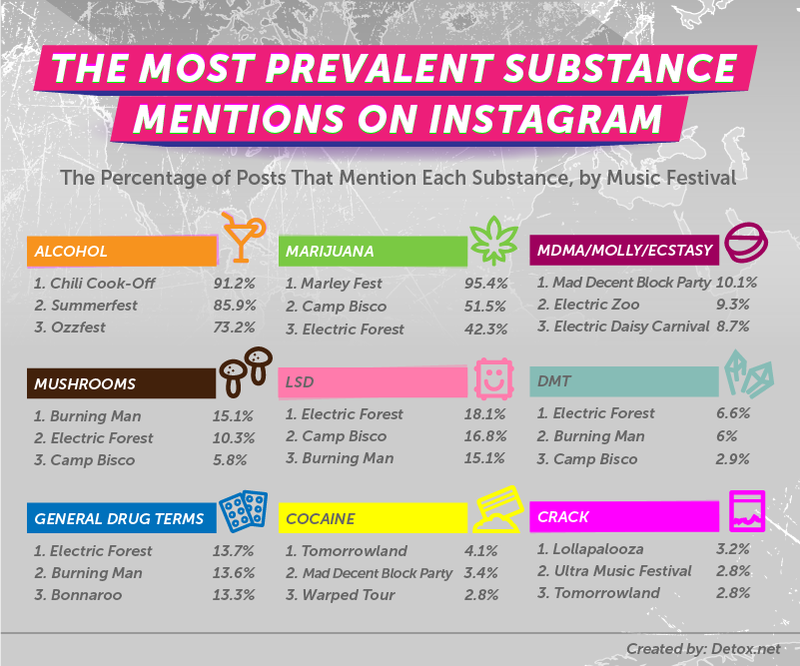 What’s a little more interesting is that while Marley Fest only made up 0.1% of the posts scraped, 5.1% of those mentioned substances, and a whopping 99.2%, mentioned drugs — the highest percentage of all. To begin with, the below chart details where all the posts Detox looked at came from. 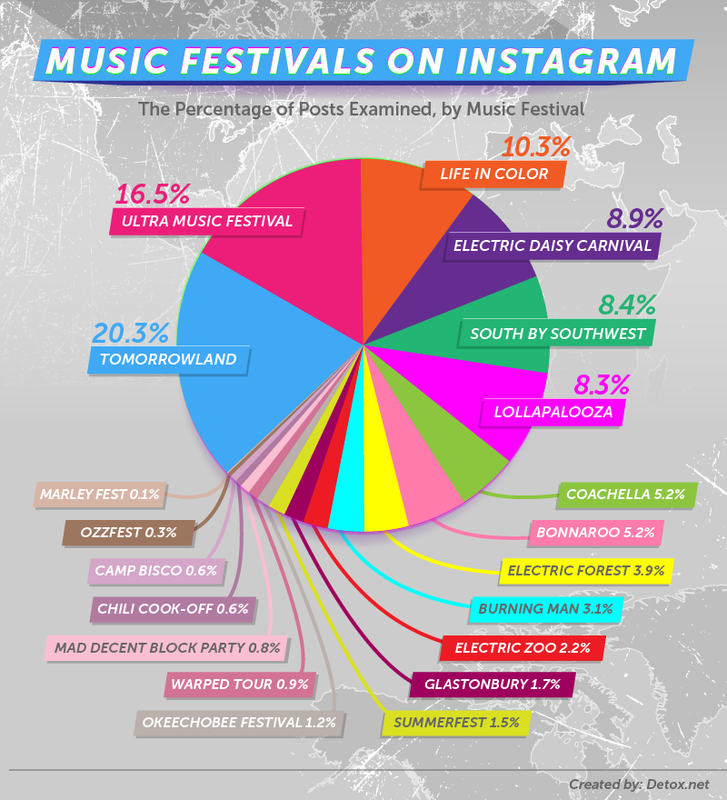 It’s worth pointing out that events with larger portions of the pie such as Tomorrowland (20.3%), Ultra Music Festival (16.5%), South by Southwest (8.4%) and Lollapalooza (8.3%) take place in urban areas that typically have decent reception. Meanwhile, festivals like Coachella (5.2%), Bonnaroo (5.2%), Electric Forest (3.9%), and Glastonbury (1.7%) are in locations where cell service is more limited, which could be part of the reason there are markedly fewer posts from those events. Next, Detox broke down how many of the posts from each festival mentioned drugs or alcohol in some way. For those thinking everyone at these events are getting wasted so surely these percentages will be sky high, prepared to be surprised. The festival with the most mentions was Coachella with just 7.6%. Next was Marley Fest with its 5.1%, and then the numbers took a massive drop-off. Burning Man, Electric Daisy Carnival, Chili Cook-Off, Summerfest, and South by Southwest only barely cracked the 2% mark, with Okeechobee bringing up the rear with 1.6%. Here’s where the real data becomes interesting. 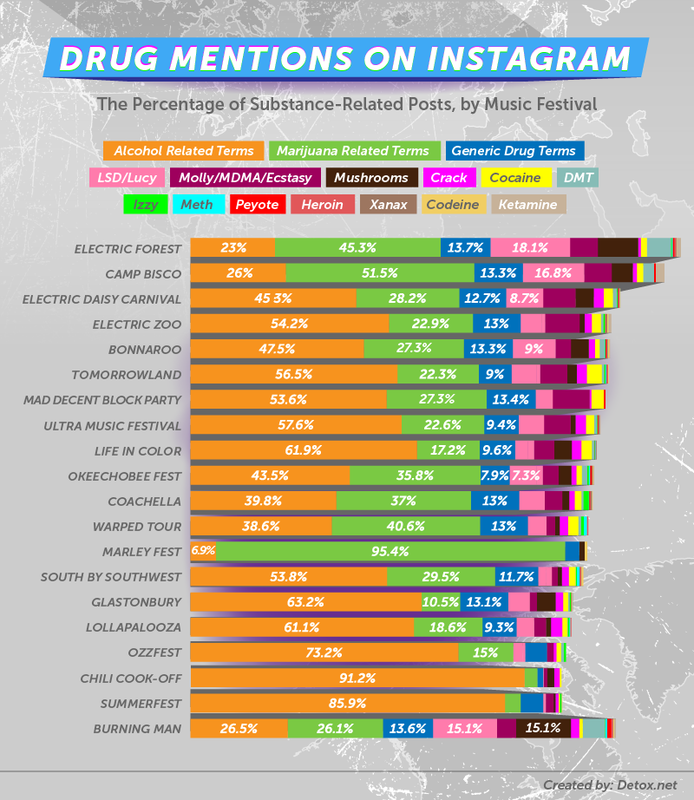 Detox next took all the posts in the above chart — those mentioning drugs or alcohol from each festival — and figured out how often specific substances were being talked about. 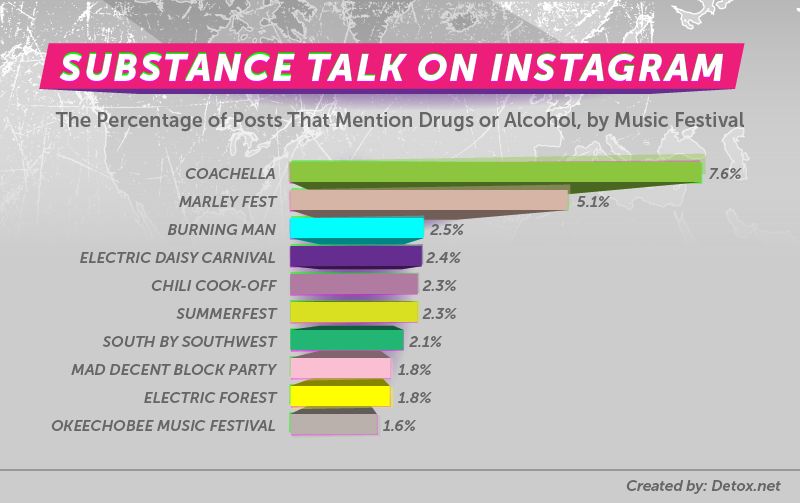 At Bonnaroo, for example, 47.5% of mentions were related to alcohol, 27.3% were about marijuana, 13.3% were just about “generic drug terms,” and 9% were about LSD. LSD was most popular at Electric Forest, where 18.1% of posts were about the psychedelic. Attendees of the Michigan fest were also fond of weed (45.3%) and alcohol (23%). Speaking of psychotropics, it’s interesting to see that Burning Man burners prefer LSD and mushrooms at precisely equal levels: 15.1%. Camp Bisco fans get down far more often on ‘shrooms (16.8%) and are pretty fond of some grass too (51.5%). The data was also broken up to show exactly where each substance was mentioned most frequently, as well. Not exactly what you think of when you consider a festival drug, crack was most popular at Lollapalooza (3.2%), with Ultra and Tomorrowland both clocking in at 2.8%. Crack’s party-ready cousin, cocaine, was also popular at Tomorrowland (4.1%), but also Mad Decent Block Party (3.4%) and Warped Tour (2.8%). Unsurprisingly, marijuana and alcohol were discussed far more often than any other drug. See how much so in the charts below. So what exactly to do with all this data? Well, unless you’re the kind of person who wants to choose your music festival based on drug consumption, probably not much. It’s simply an interesting look at how different recreational drugs overlap with different recreational events. What’s important to keep in mind, however, is that wherever you end up and whatever you do, be safe. Know your limits, and if you have a problem, reach out to folks like Detox or Harmonium, a group providing safe, welcoming places to stay sober at music festivals. It’s also important to remember that while festivals do not approve of or allow drug use of any kind, medical personnel on site will not get you in trouble if you go to them for help. If you or your friend is having a bad time because of a substance they took, remember that the worst that’s going to happen if you seek medical assistance is a disapproving look — and that’s way less important than your health and safety. Be smart, be considerate, and be safe. This is festival season, after all, and we all want to have the best time possible.